Sri Lanka recorded its highest-ever level of apparel exports during the year ended 31 December 2017, courtesy of the restoration of the Generalized System of Preferences Plus (GSP+) facility, a Joint Apparel Association Forum (JAAF) spokesman told Ceylon FT. According to JAAF, Sri Lanka’s total apparel export figure last year was over US$ 4.8 billion, which is an increase of 3.06 per cent over 2016. However, Sri Lanka is yet to announce its official full-year (2017) total textile export figures. During 2017, the island had exported over US$ 2.2 billion worth of apparel to the USA (up 1.9% compared to 2016), US$ 2.0 billion worth of apparel to EU nations (up 4%) and US$ 630 million to the rest of the world (up 3.7%) . Speaking to Ceylon FT, JAAF General Secretary Tuly Cooray said they had set an ambitious target of US$ 5.2 billion in textile and apparel exports for 2018, and an US$ 8 billion apparel export target in 2020. “We are happy to say that we are gradually gaining the benefits of GSP+; during the last two or three months, it has really boosted our exports,” he said. 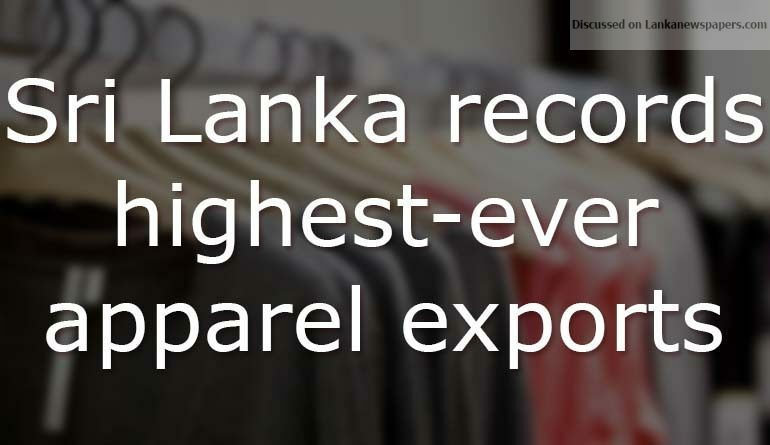 The apparel sector is both Sri Lanka’s highest industrial employment generator and its highest foreign exchange earner. Meanwhile, the Central Bank, in a statement issued on Friday, said Sri Lanka’s export earnings from garments increased for the fifth consecutive month in November 2017, seeing increased demand from the EU, USA, and non-traditional markets such as Australia, Hong Kong and UAE. According to Central Bank statistics, Sri Lanka’s earnings from textiles and garments during the first eleven months of 2017 increased by 1.6% year-on-year to US$ 4.6 billion. The first eleven months of 2017 recorded US$ 1.96 billion in exports to USA and US$ 1.8 billion in exports to the European Union. Following the restoration of the GSP+ facility, earnings from garment exports to the EU continued to expand, and in November 2017, they grew by 13.8 per cent year-on-year, while garment exports to the USA increased by 11.9 per cent.